How can you build and retain relationships with your audience and customers? In the world of social networks and content marketing, there’s a tool that still brings great results: the good old email. 92% of online adults use email, according to Pew Research. Other stats also show that email newsletters have a higher engagement rate and that the rate has been going up during the last years. And it makes sense since email is the most personal and direct way to share a message with someone. As a continuation of my last post on using Paper.li for your Inbound Marketing efforts, let’s go more in-depth about the use of email newsletters to super power your business strategy. Retain your customers by staying top of mind. Use email to remind your clients that you’re there. Highlight a customer of the month, share updates, exclusive news, or just nurture them with a holiday message. 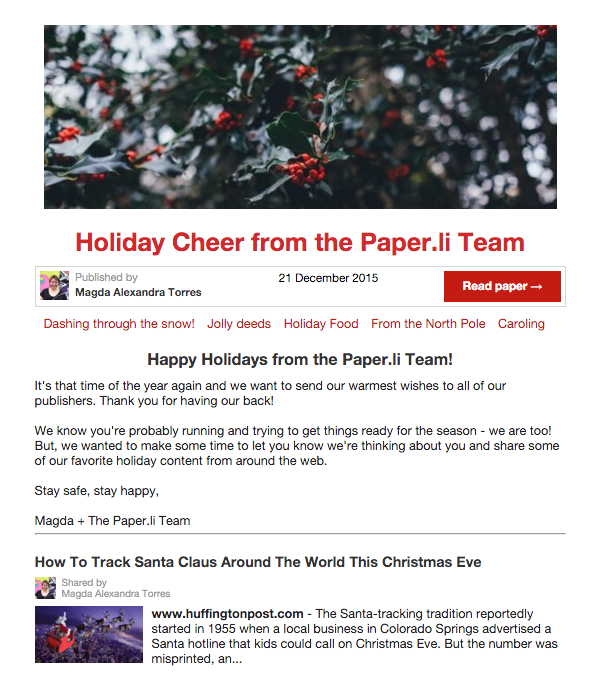 Here’s a newsletter we sent using the Paper.li newsletter service back in December. Be a thought leader. Do you want to be known as an expert in your field? Establish yourself as a thought leader by sharing news and updates regarding that particular topic. Pro Tip: Enable Draft Mode, if you want to make sure the content in the newsletter is perfect before you send it to your contacts. Increase revenue by sending special promotions. An excellent way to make your customers feel special is by sending them special offers targeted just for them. Your client saves money, and you get a nice boost. Get creative here but make sure to not over-do it; some excellent offers can include free shipping or 2 for the price of 1. Not convinced yet? Numbers don’t lie, take a look at these 25 mind-blowing Email Marketing Stats. Special Note: If your customers gave their email addresses to you, it means they trust you – don’t break that confidence and make sure you use email the right way. Don’t use Email Marketing lightly; I recommend you check some rules and laws before you start thinking of an email marketing plan. One of the drawbacks of implementing an Email Marketing plan is that often you don’t have the time or don’t know the right tools to use. Emails need to be sent regularly and consistently but without exaggerating as you don’t want people to get tired of them and unsubscribe. What’s the easiest way to save time and have your work almost done? The Paper.li Newsletter! We’re proud to have been mentioned in this post highlighting the 100 Awesome Resources for First Time Entrepreneurs, but truth be told, going Pro takes the cake when it comes to giving you all you need for a great email newsletter experience in Paper.li. Here’s why! – Good content provides value to your subscribers: Your customers will remember you not only for your great product and services but also for the useful, relevant content you bring them. – Take advantage of easy customization and branding: Make your email look as if a professional designer created it. Give it a professional, customized touch by choosing one of three design options and by adding your banner to the top. – Use it as a complement to your existing newsletter: Paper.li provides a full integration with MailChimp or in case you use any other mailing service, you can export your Paper.li newsletter in HTML format and upload it to your usual provider. – It’s only $9 a month or $99 a year! Paper.li Pro is a cheaper yet powerful alternative to other, more conventional newsletter services. If you’re looking to save some money, try our all-in-one product. Have any questions about using Paper.li as your Email Newsletter tool? Leave them below! Excellent ideas, Magda! Will try the Paper.li newsletter ASAP! Thanks! Glad you found the useful, Ben! how do I add my name after Paper.li and before my number ? then where can I find it, so I can email my personal list ?